From Chris Kimble: The Junior Miners/Senior Miners Ratio (GDXJ/GDX) can often signal when key turning points are about to take place for Gold & Silver Miners. Above looks at this ratio, which highlights that a multi-year narrowing pennant pattern has been forming (higher lows and lower highs). 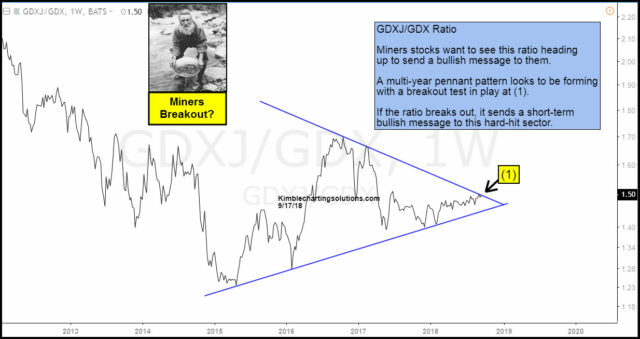 Despite Gold, Silver, GDX, and GDXJ heading much lower over the past several months, this important ratio has actually been heading higher and it is facing a key breakout test at (1). Should this ratio breakout, it would send a short-term bullish message to the out of favor mining sector. 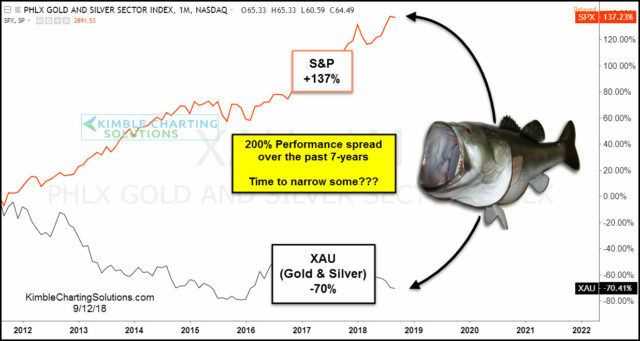 If the GDXJ/GDX ratio breaks out, the odds increase that the large spread between the S&P and the XAU index will narrow! If you are interested in short & long-term investment solutions for Gold, Silver, Miners, and Copper, being a Metals Member could become a big advantage for you! The VanEck Vectors Gold Miners ETF (GDX) rose $0.05 (+0.27%) in premarket trading Tuesday. Year-to-date, GDX has declined -21.17%, versus a 8.86% rise in the benchmark S&P 500 index during the same period.